We caught up with Fred Wildnauer, a woodworker and solar customer in South Berwick, to talk about the value of adding solar to his business and the value of going solar both for economic and environmental reasons. RE: Tell us about yourself – What was your motivation for going solar? FW: I have a small custom woodworking business in an outbuilding on my property. 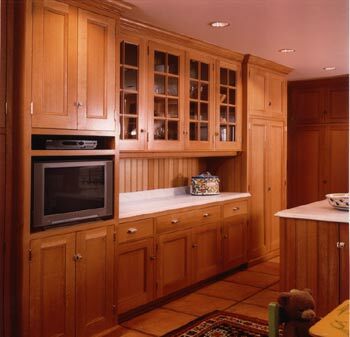 I have 3 employees and we specialize in cabinets for kitchens, libraries, bathrooms and media rooms. Most of my work is residential but I have done some church work and public libraries. I have been in my present location for about 25 years. My building is about 30 feet wide and 100 feet long and is oriented north-south. The south facing wall of my shop has 5 large windows that I salvaged from an automobile garage that was being torn down. I had always noticed that I got enough warmth through these windows in the winter so that my heating needs were minimal. I also noticed that there was quite a bit of heat gain from running the all the woodworking equipment during the day. Thinking about how fortunate we were because of those two things, I had one of those “ah ha” moments: I have a near perfect situation for solar power! I live in a part of the world where you must drive a car. I heat my shop with propane and my house with heating oil (albeit biodiesel). I work with wood, sometimes exotic woods like teak, mahogany, rosewood and others. Sure, wood is a renewable but loggers build the roads that allow the people to burn down the forest for cattle grazing. Loggers are the first exploiters of the forest. I am not planting a tree for every tree I use. Thinking about all these things (sanding gives one lots of time to think) I vowed to become less part of the problem and more part of the solution. I started my research into going solar. One of my main clients is a contractor in Portsmouth, NH called EcoSound Builders. Pete and Ethan, the owners, are building homes and additions that are ecologically responsible. I started talking about solar with those guys and they said that the only company to talk to was Revision Energy. I think Pete used you guys on his own house which is one of my favorite homes on the Seacoast. The whole idea still had to make sense for my bottom line. Frankly, like most of the folks in construction, the last economic downturn was tough. I barely survived and I was not interested in going farther into debt. But, this year, things began to look better. Also, the federal tax credit looked like it might go away with an administration change in Washington. I decided to get serious and I called ReVision. Learn more about Fred’s transition to solar by reading on at our blog, also visit: http://wildnauer.com/ to learn about his custom woodworking services.